NOTICE: Activation key must be used on a valid Steam account, requires internet connection. ABOUT THE GAME	In a story where everything is left to be written, become the muse who unfolds a brand new adventure. Epistory is the adventure of a writer in lack of inspiration who asks his muse for help to write his latest book. The game immerses you in an atmospheric third person action / adventure… game in 3D with the particularity of only being played with the keyboard. In Epistory you play the muse, a fictional character in a world where everything is left to be written. Your adventure begins on a blank page, but the world will soon become larger and livelier as you gather inspiration, face enemies and solve its mysteries. 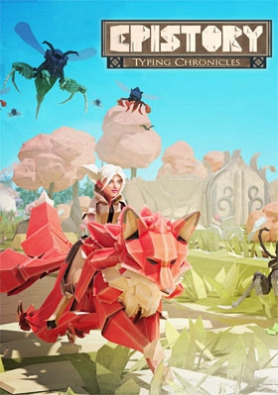 From movement to opening chests or fighting in epic battles, every element in the game has its own fun way to ask you to type. As you progress and explore the world, the paper world expands in the writer’s mind, the story literally unfolds and the mysteries of the magic power of the words are revealed.KEY FEATURES Play as the muse riding a giant 3 tailed fox lost in a unique fantasy 3D environment Solve mysterious puzzles and defeat enemies in challenging epic combats You are in the writer’s head, unfolding the story as you explore the world All words you type have a meaning and might influence the outcome of the story One of its kind typing game where everything is keyboard controlled (qwerty, azerty, qwertz, dvorak support) Adaptive difficulty Arenas with leaderboards for players who want a challenge (coming up) Steam integration (leaderboards, achievements, workshop, trading cards) (coming up)SYSTEM REQUIREMENTS Windows Minimum: OS: Microsoft Windows XP/Vista/7/8/8.1/10 Processor: Intel Core i5 2400 -OR- AMD Phenom II X6 1100T Memory: 4 GB RAM Graphics: ATI Radeon HD4850 -OR- GeForce GTX 295 (Does not support Intel Integrated Graphics Cards) Hard Drive: 1 GB available spaceMac Minimum: OS: OS X 10.9 Memory: 4 GB Hard Drive: 1 GB Notes: Tested on a 2010 MacMini Linux Minimum: Processor: Intel Core i5 2400 OR AMD Phenom II X6 1100T Memory: 4 GB Graphiques : ATI Radeon HD4850 OR GeForce GTX 295 (Does not support Intel Integrated Graphics Cards) Hard Drive: 1 GB Notes: Tested on Ubuntu 14.04.